Make the best Thanksgiving side dishes with these easy recipes! These super easy restaurant recipes in this FREE eCookbook will help make your next Thanksgiving holiday the best one ever. Some of my very favorite memories of growing up were baking with my grandma. Even now, it's still one of my favorite things to do! Grannie and I will spend afternoons baking the most delicious cakes, cookies and main dishes. 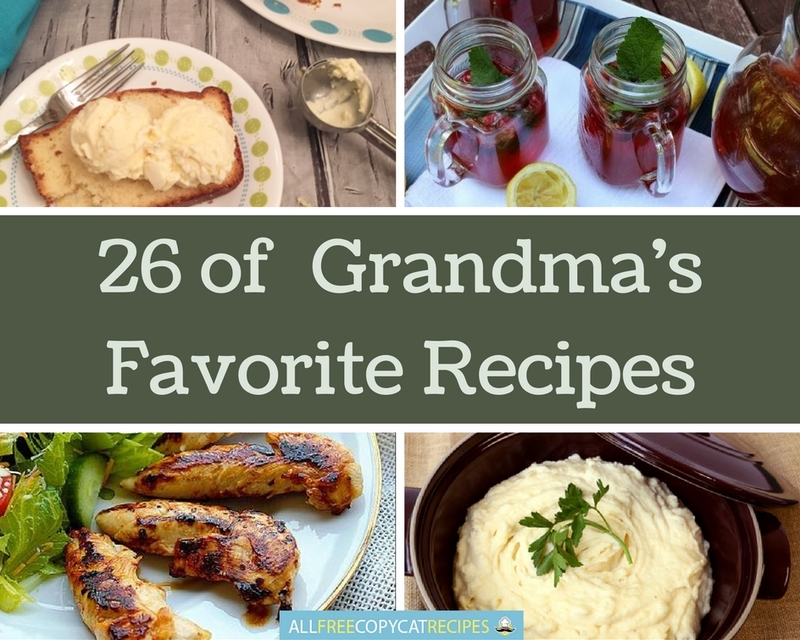 I let her homemade recipes be my guide when putting together this collection of 26 of Grandma's Favorite Recipes. They're grandkid tested, Grandma approved. If you're looking to put a delicious, savory meal on the table, take a peek at our list of easy main dishes. When you're ready, browse our collection of vintage charming desserts. Pick you favorite and invite your nearest and dearest to your kitchen to start the baking extravaganza! We've even got an extra special feature we hope you'll enjoy: 15 Copycat Recipes for Church Suppers. Copycat Luby's Fried Cabbage - This southern recipe is one of grandma's very favorites. If you're looking for the perfect potluck pick, Copycat Luby's Fried Cabbage has got you covered. It's a simple dish that the whole family can enjoy. Copycat Bennigan's Turkey O'Toole - This old-fashioned copycat recipe is sure to make the dinner rotation in your house. Copycat Bennigan's Turkey O'Toole is an Irish-style main dish that's warm, easy and cheesy. It's made with a pretzel roll, just like Auntie Anne's. 12 Copycat Recipes for Church Suppers - Sunday is a special day of the week. After attending church, isn't it nice to settle in for a delicious dinner? Below are some of our favorite easy, homestyle meals perfect for your next church supper or potluck. Rain or shine, you'll want to cook these easy main dish recipes with your family and pass on special Sunday traditions from generation to generation. Homemade Cracker Barrel Grilled Chicken Tenderloins - These homemade chicken tenderloins are such good comfort food. If you're craving something that will put a smile on your guests' faces, give this recipe a try. Old Fashioned Blackberry Bramble - Enjoy a lazy day with this simple drink recipe. Old Fashioned Blackberry Bramble is a 20s-inspired beverage that's just as delicious today. Homestyle Masted Potatoes Cracker Barrel Style - Mashed potatoes are a classic old-fashioned side dish recipe. They're simple to make, and this recipe is made in a slow cooker, which makes them even easier! Kenny and Ziggy's Homemade Egg Salad - No summer picnic would be complete without this egg salad recipe. It's easy to make becuase it's so simple. But it's delicious, too. Take it to your next summer potluck and watch it fly off the plate. Copycat Snapple Cranberry Iced Tea - Quench your thurst with this cranberry iced tea recipe. It's fruity and refreshing, and it's just like the tea that your grandma always made. For more great comfort food recipes, check out these 26 Best Copycat Cracker Barrel Recipes! Copycat Denny's Red Velvet Puppies with Cream Cheese Icing - Calling all late night diners! If you're a night owl that likes to eat well, this is the easy dessert recipe for you. White Chocolate Texas Sheet Cake - Have you heard of the famous Texas Sheet Cake? This fabulous lookalike recipe is the white chocolate version. Sheet cake is an amazing dessert to make when you are having company over. A little goes a long way when you are baking up this sweet treat. This recipe is one of grandma's favorites, so you best check it out. Copycat TGI Friday's Malt Cake - If you grew up on malted milk shakes and can't get enough of that malted flavor, you'll love unusual, yet completely fabulous restaurant recipes like this one for T.G.I. Friday's Malt Cake. It's an old fashioned recipe that you can make with your grandma. Copycat Cracker Barrel Banana Pudding - This non-bake banana pudding recipe is family friendly so you don't have to worry about dealing with a hot stove or oven! If you've yet to try homemade banana pudding, I highly recommend it. Homemade Cheesecake Factory Red Velvet Cheesecake - Are you ready for the ultimate dessert? Just-Like Cheesecake Factory Red Velvet Cheesecake is just the easy cake recipe you're looking for. Savor the sweet flavor of red velvet combined with the luscious texture of cheesecake for an out of this world treat almost everyone will love. Best Basic Butter Pound Cake - This pound cake recipe is simple, but it's definitely a classic. Once you try this dessert recipe, you'll be flooded with memories of your grandma's desserts. This is definitely a must-have recipe for your recipe box. How fun! My fiance and I always like to search for copycat recipes from our favorite restaurants. He's pretty good good at figuring out the spices and other ingredients. This collection of recipes will make our search a lot easier. Bookmarking for use-will out these into our dinner rotation.